A wonderful day driving through the heart of Oregon, scenery spectacular with amazing variety. From Portland to the state capital of Salem we’re reminded of how productive the Willamette Valley is – vineyards, Christmas tree farms, berry patches, nurseries, gardens, vegetables. We share memories to previous visits to tulip farms in March, peony and iris farms in June and the botanical treasure of Oregon Gardens. As we climb into the Cascade range autumn-hued ground covers and shrubbery color the landscape in contrast to the deep, deep greens of the western slope coniferous forest. After 2 1/2 hours of drive time we take a break at the Sahalee Falls Viewpoint. Fifteen minutes out of the car for the short walk to see the falls does the body and mind a world of good. 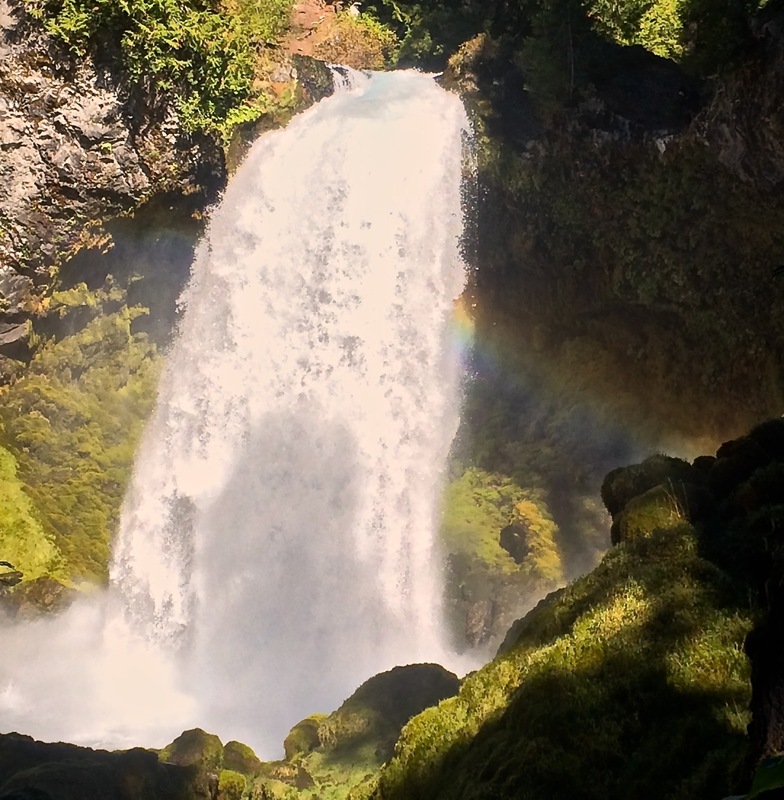 Sahalee is only one of a series of falls along the McKenzie River. I’ve read and seen pictures of the McKenzie Pass road for years, today is the day to see it for ourselves. 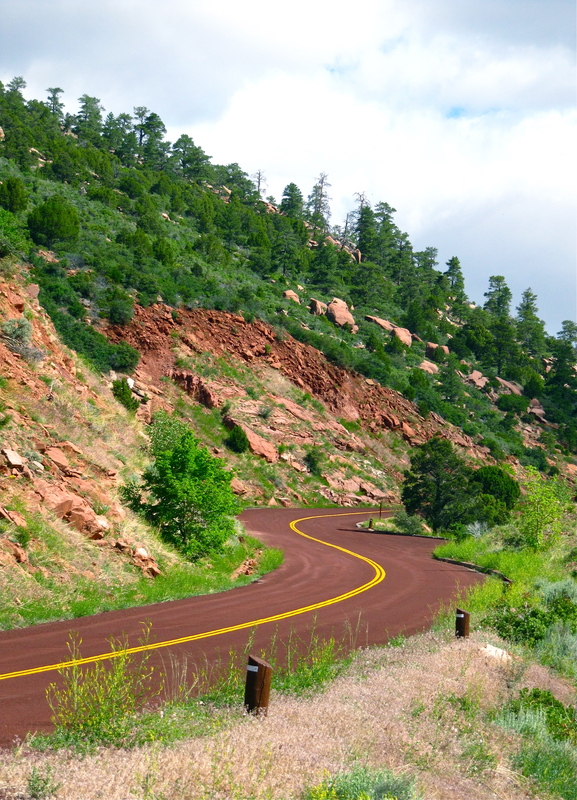 Vehicle width and length restrictions are enforced on 22 miles of the scenic byway. We soon understand the limits, the road is very narrow and winding with sharp turns. This isn’t the route for travelers in a hurry, it’s slow going but worth the time required. 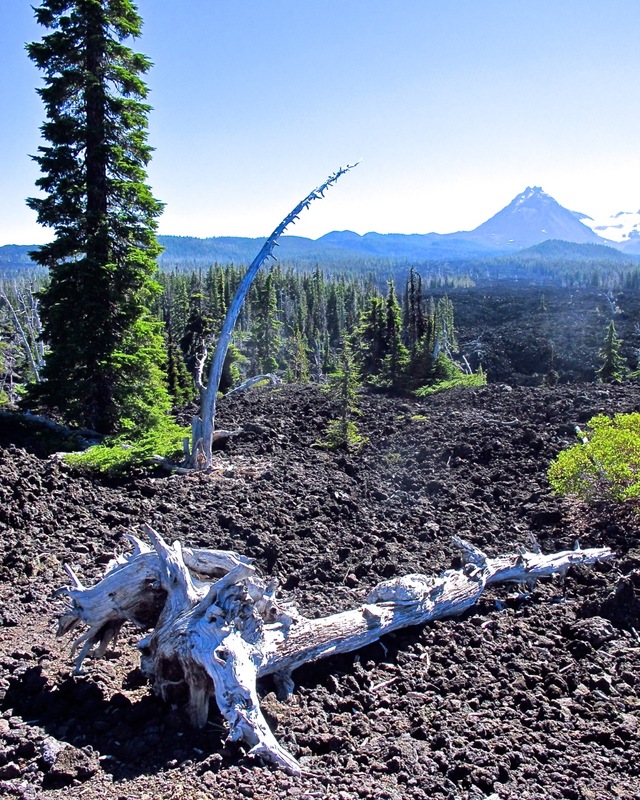 Atop the pass a 65-square mile lava flow creates an other worldly landscape; trees pushing their way upward from the volcanic debris and twisted dead trunks bleached nearly white. 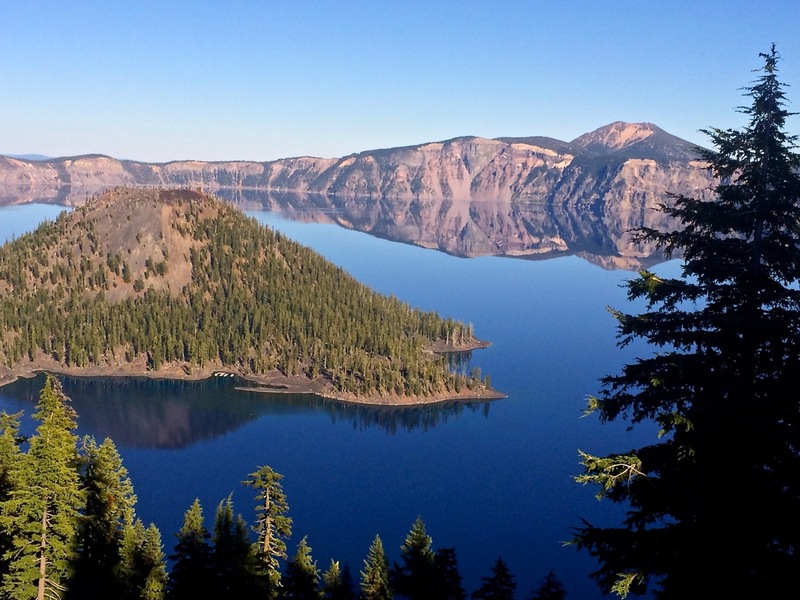 A slight detour takes us to Crater Lake National Park. We’ve been here two times before. The first was more than 20 years ago in late March. There was 27-feet of snow on the ground; we literally walked trough a snow tunnel to a viewing platform on the edge to see into the lake. In 2001 we had reservations for two nights; our first morning was 9/11. At that time there were no televisions in the park and radio reception was spotty. We spent the day driving around the lake finding high spots where we could listen to the awful news. Todays visit was perfect, although too short. Sky and lake were blue, blue, blue and windless; creating incredible perfect reflections of the steep caldera sides in the calm waters. Truly a priceless gift to see the park on such a day of amazing scenery. Can’t believe we’re two weeks into our driving trip to the Pacific Northwest, the first days seem so long ago – so much spectacular country between here and home. Taking a moment to reflect on the 14 days reminds us of all we’ve seen and experienced. We won’t soon forget seeing two American Bald Eagles while on the Waterton Lake Cruise, a grizzly ambling through a grassy field in Glacier Nt. Park, and a mother brown bear and two cubs chowing down in the same field two days in a row. Never before had we seen a rainbow and its reflection like the one at Emerald Lake. Alternating between hotels, Nt. Park lodges, bed and breakfasts and the hospitality of family we’ve been fortunate to have no horror stories of places you would never catch us in again. It had been years since we’d stayed in a Ramada Inn and the memories aren’t great. 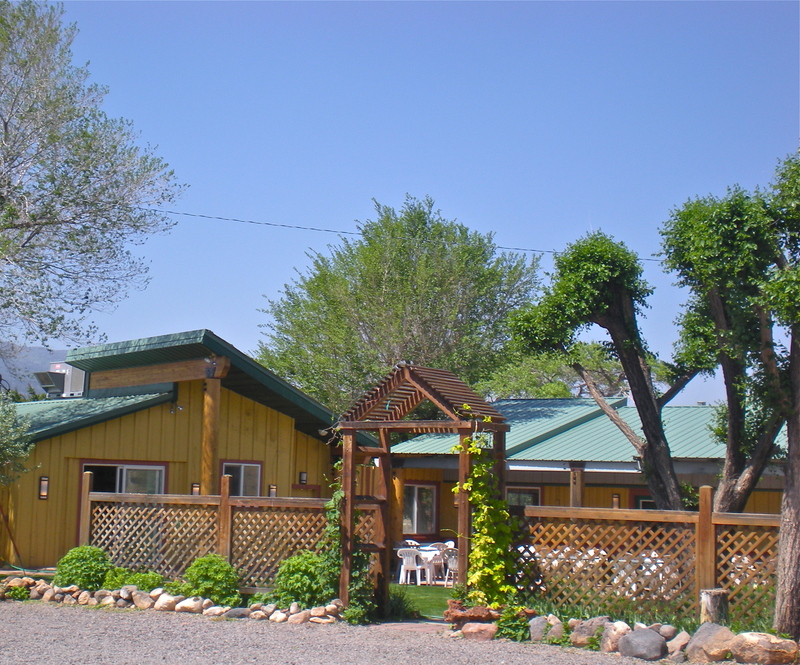 When we needed lodging in Pincher Creek, Alberta a Ramada looked like the best choice; and I’m sure it was. The room was large, very clean, bed and linens of good quality, front desk staff friendly and efficient. Left this hotel with a new attitude towards the brand. 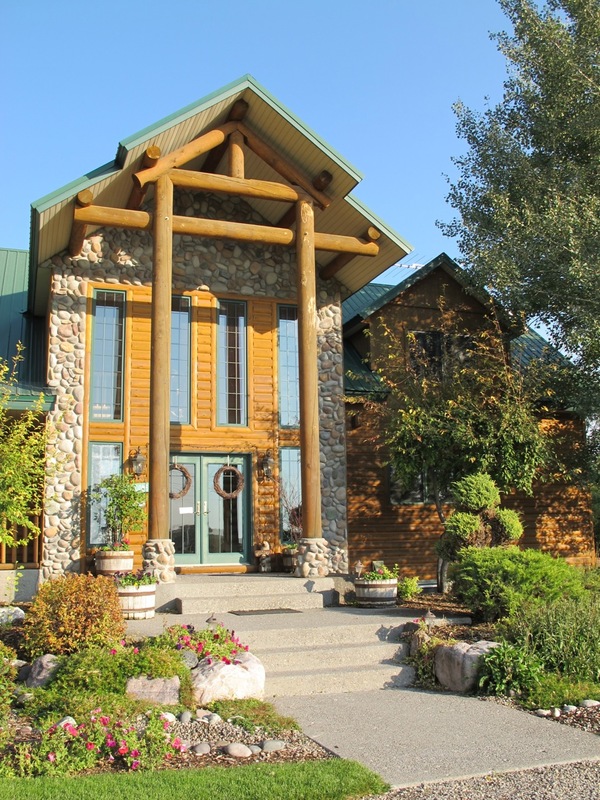 Definitely would return to the three B&Bs we’ve visited – Blue Heron Inn in Rigby, Idaho, Bad Rock B&B in Columbia Falls, Montana and Cromier B&B in Penticton, British Columbia. Each were unique with gracious hosts and gave a more personal experience to their area. 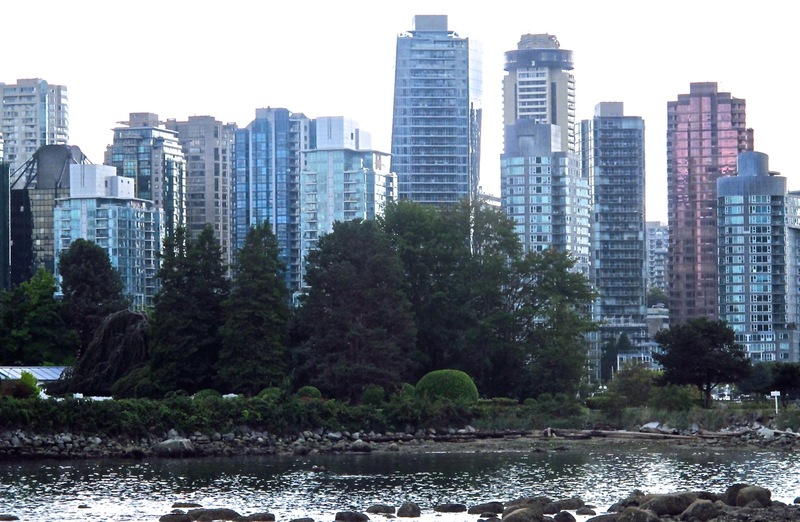 No big cities until we arrived in Vancouver today. Listed as the worst travel congestion and most traffic delays in all of Canada we’re quickly reminded of the realities of city life. 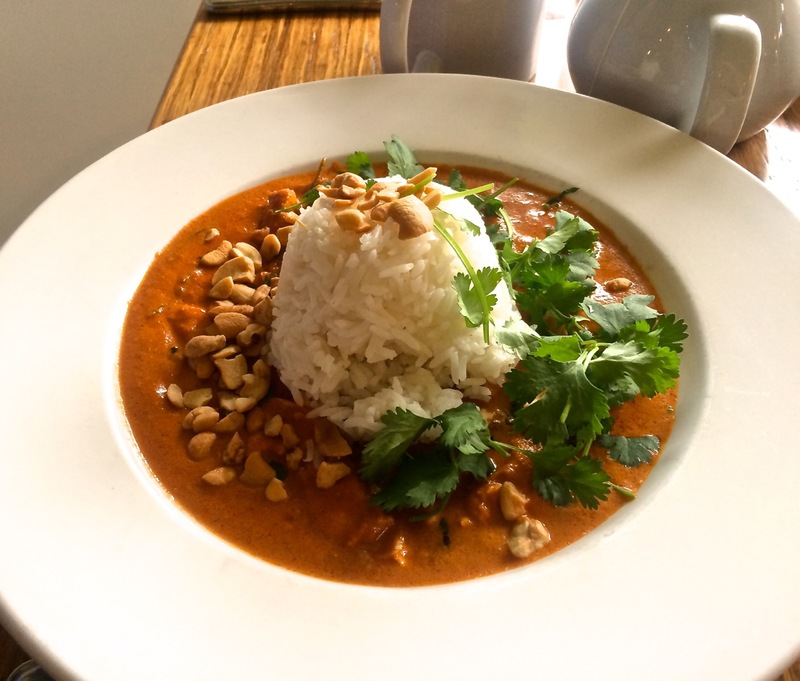 We’ve eaten in a variety of restaurants from neighborhood bistros to formal dining rooms (the worst service). I even have to admit to one stop at a McDonalds.We like to focus on local food whenever possible – huckleberries in Montana, saskatoon berries in Alberta, fresh from the orchard plums, pears, apples, artisan cheese and boutique wines in BC’s Okanagan Valley and fresh seafood in Vancouver. Dinosaur digs, jagged mountain peaks, aqua blue glacier-fed rivers, acres of trees heavy with ripening apples, black angus grazing in seemingly endless grasslands, dense forest of towering western red cedar, new mown hay awaiting baling, golden aspen in their fall glory, hillsides covered in rows of vineyards, and rushing rivers, foggy mornings, clouds lying low in mountain valleys, vivid sunrises, a day without a single cloud in the sky, sheets of driving rain – visions captured in photographs and the mind. Memories. What will the next two weeks reveal? 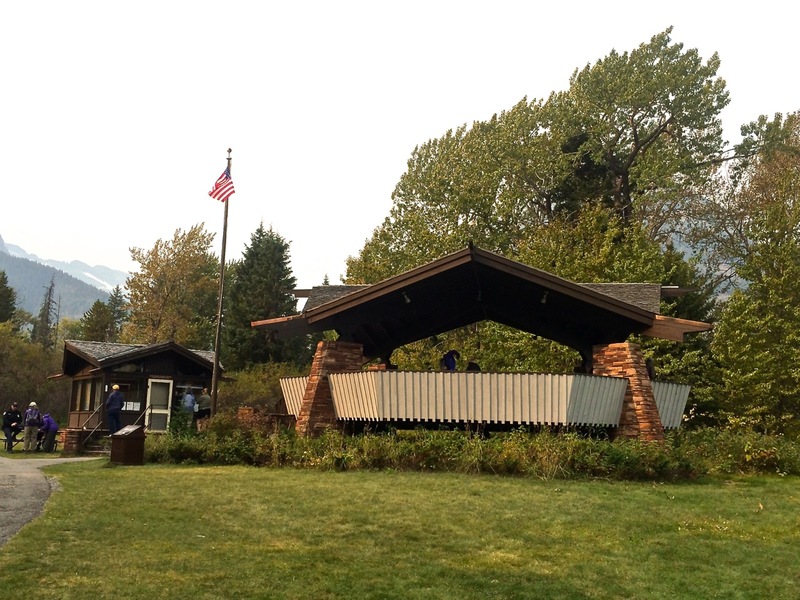 Tourist season in the village of Waterton Lake, Albert, Canada winds down in mid-September. We’ve hit a pleasant day with sunshine therefore we decide to take the morning cruise on the Historic M.V. International. The 9-mile long lake spans the US/Canadian boarder. 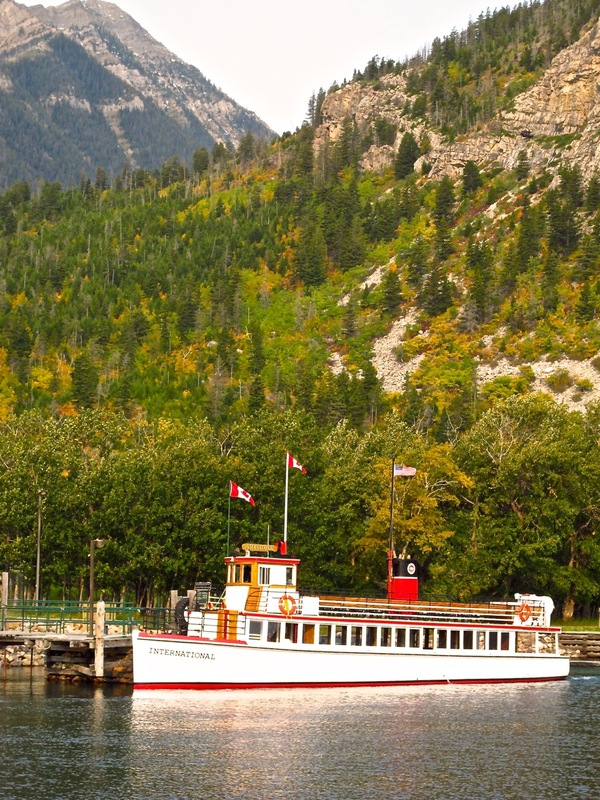 The narrated 2-¼-hour trip on Upper Waterton Lake leaves from the townsite, the boat stops at Goat Haunt, Montana for 30 minutes. 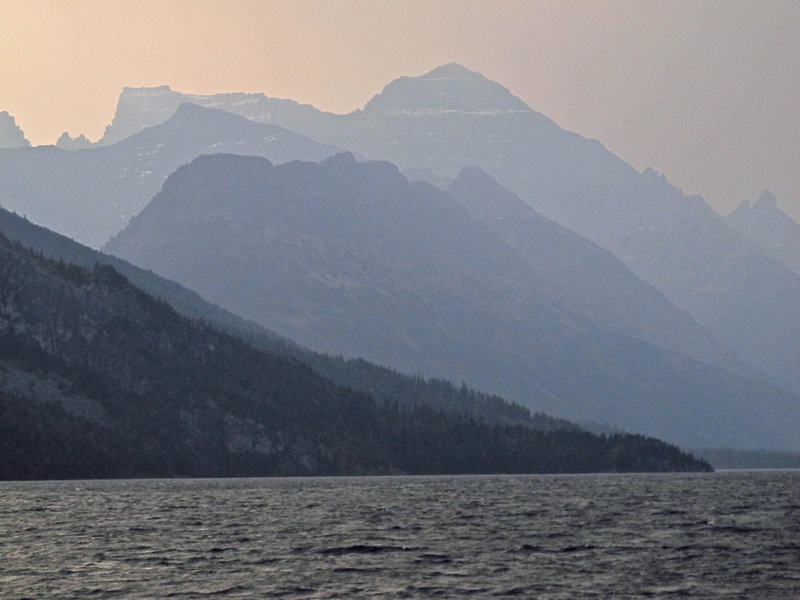 Haze from several forest fires in the American west affects our views of the rugged mountains in the backcountry of Waterton Glacier International Peace Park. 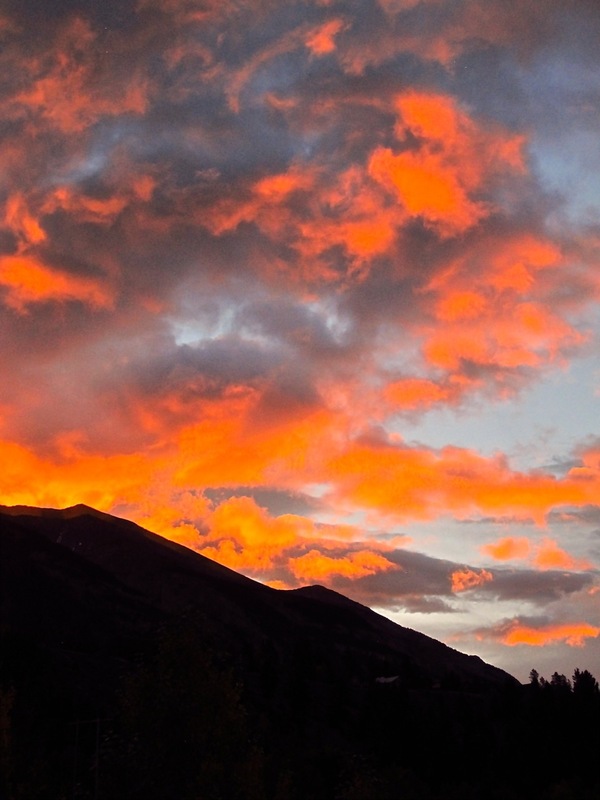 Ridge after ridge – each becomes fainter. The crew spots two American Bald Eagles, slows the boat and shuts down the engines. 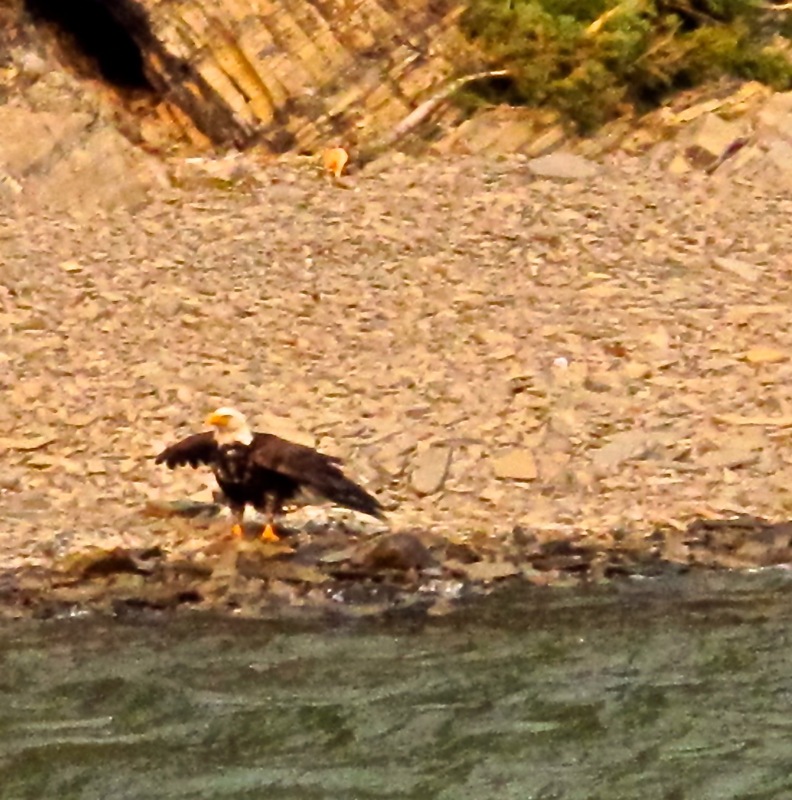 We watch as one of the eagles stands on the stony shore spreading and flapping it’s wings. Our guide informs us that eagles do not have waterproof feathers so if one goes underwater for a fish they must dry their wings before flying again. The second eagle sits high in a pine tree seemingly on lookout. About half way down the lake we cross the 49th parallel the boundary between the United States and Canada. Passengers may disembark at Goat Haunt to peruse the open-air visitor center focusing on local wildlife or take the lakeside walk to a viewing platform. Those wishing to hike further into the park must clear US customs – surely one of the most remote of border custom stations. 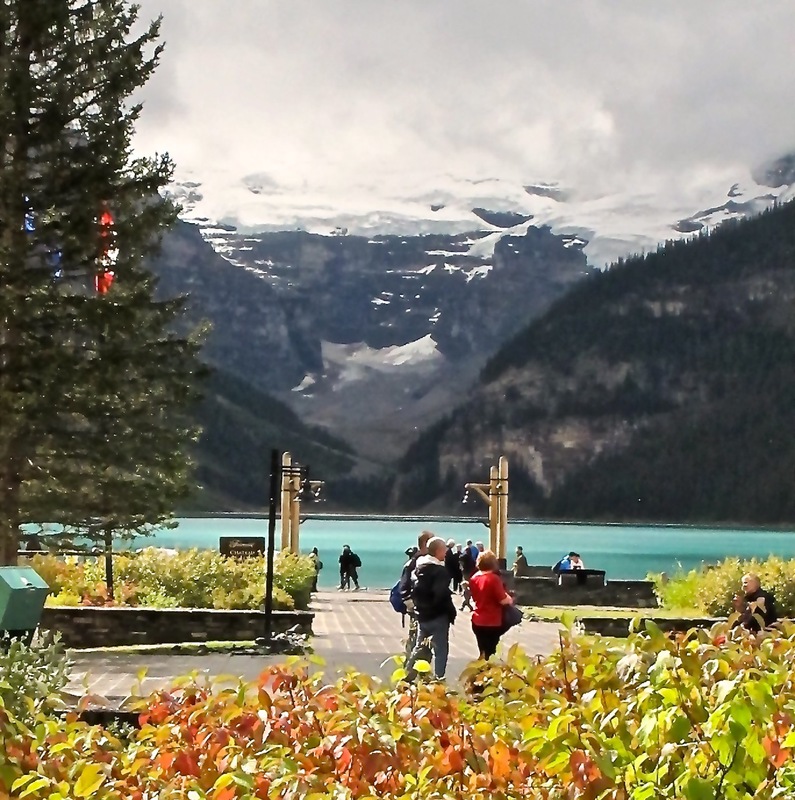 Hikers may return on a later trip this afternoon or the hearty can hike back up the lake to the townsite. With decreased wind and increased sunshine the trip back to Waterton Lakes is uncommonly warm and pleasant, no need for jacket or the shelter of the lower deck. We’ve been on this cruise a couple of times in the summer yet today is the mildest we’ve experienced. 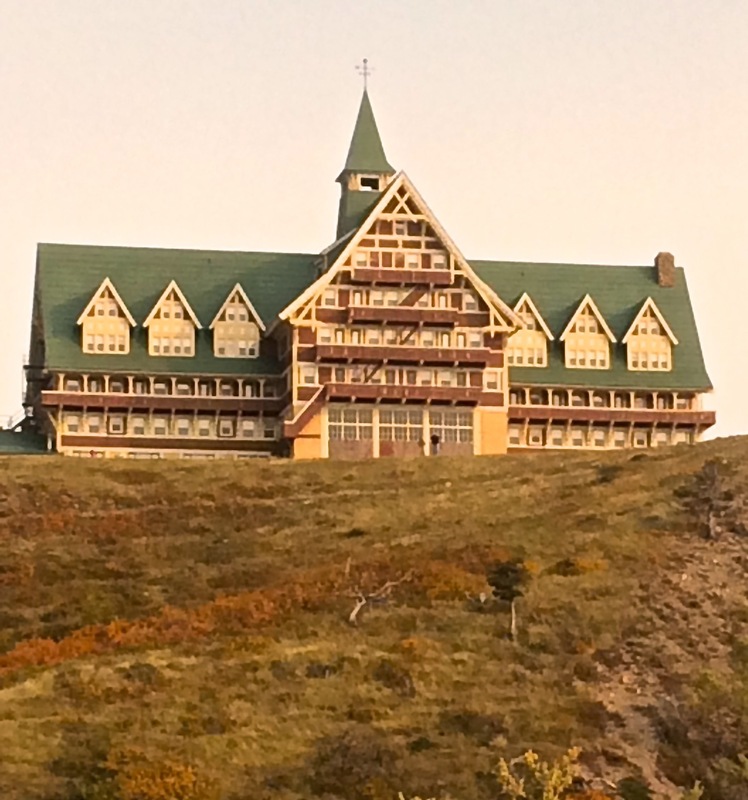 The stately Prince of Wales hotel sits above the north end of the lake. Bob hoped to partake of high tea at the hotel but it has closed for the season with the tall lobby windows being boarded up for winter protection. 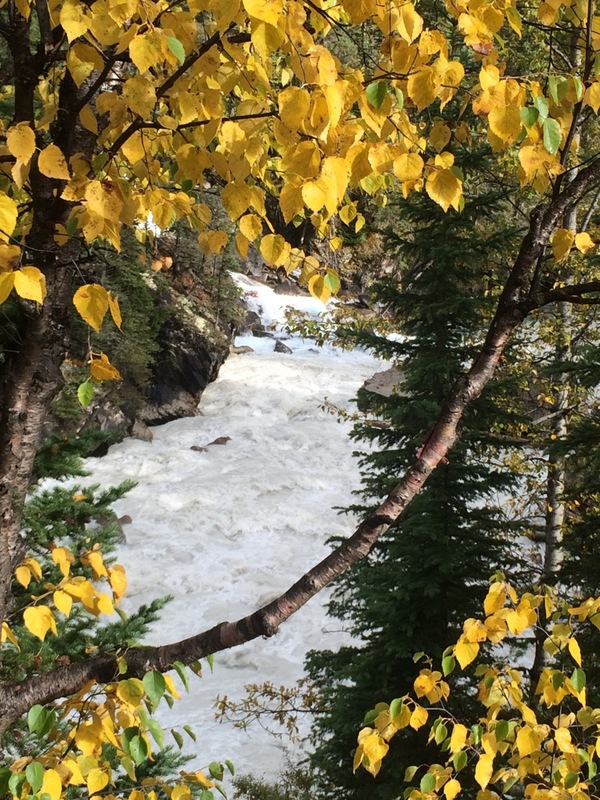 Last week a snow storm hit the park; we’re incredibly fortunate to have such a lovely September day in the park. 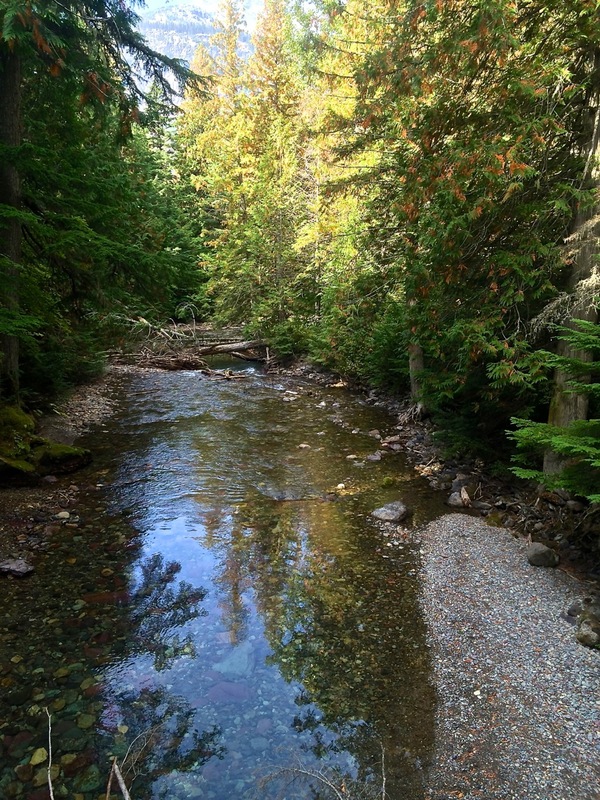 We love this walk beneath the canopy of old trees along Avalanche Creek on the west side of Glacier National Park. Western red cedar dominate the grove. Black cottonwood with its deeply grooved bark and Western hemlock are also prominent. Many of these trees reach heights of over two hundred feet. 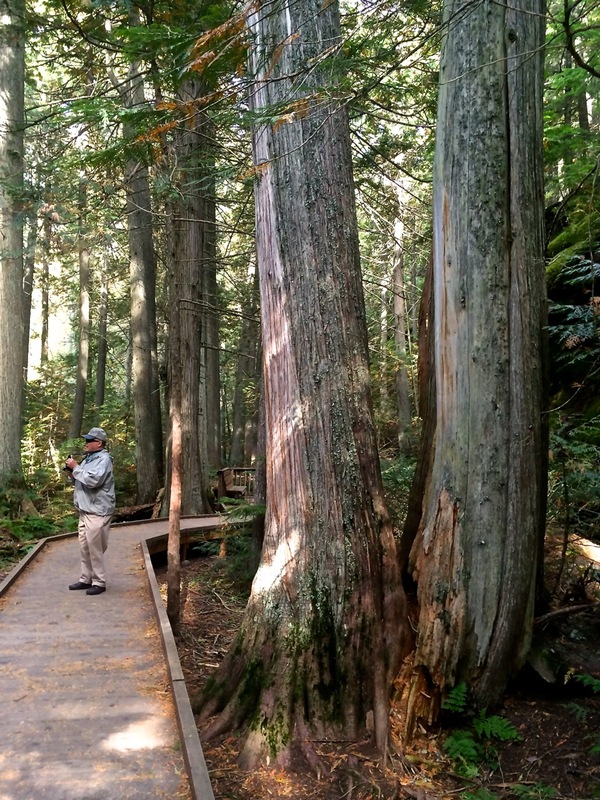 The cedars and hemlocks can live to over 1,000 years. 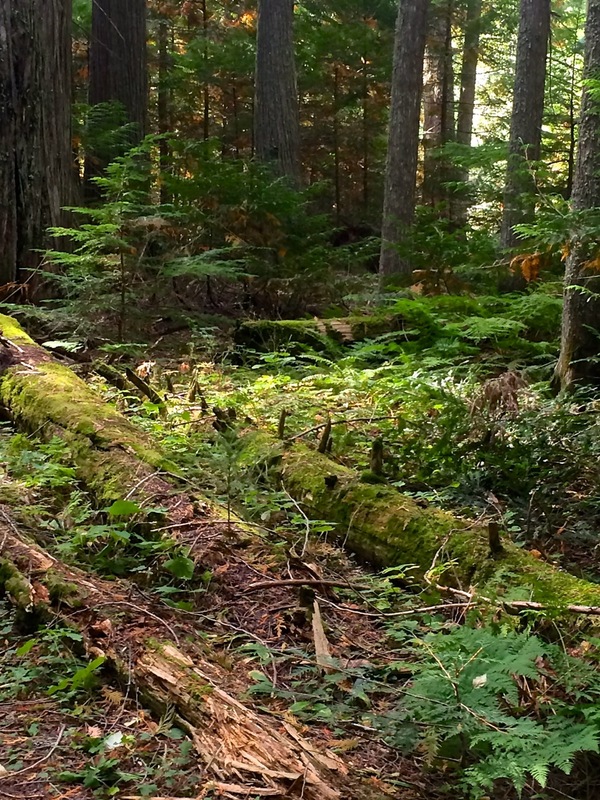 About half of the trail is along a board walk raised about the spongy forest floor covered with decomposing logs, dropped needles and shade tolerant plants. Mosses hang from dying branches. In this moist enclave lichens and moss streak tree trunks. Along the eastern side of the loop trail shaded rocky hills drip with constant water seepage. This one has definitely been on my Bucket List. 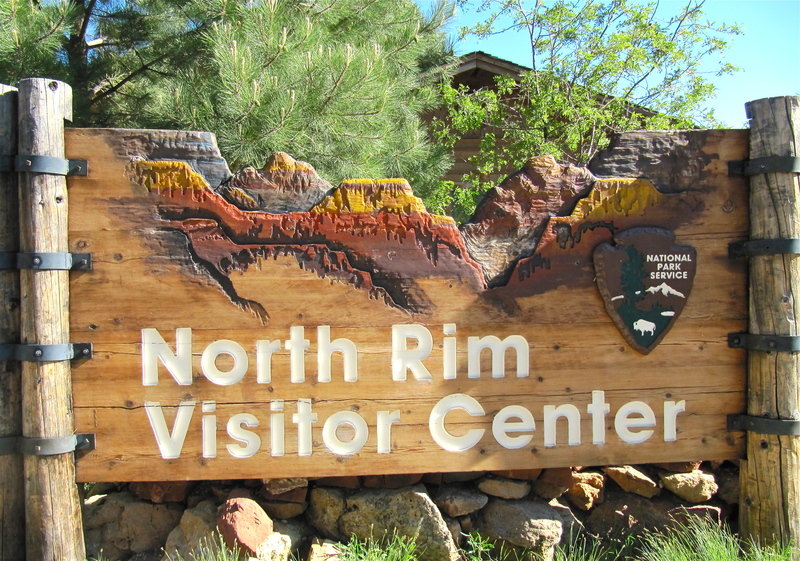 With a half-dozen trips to the South Rim I, like most Grand Canyon National Park visitors, had never been to the North Rim. We normally travel to the Canyon in late winter or early spring when the road into the north side is under several feet of snow. 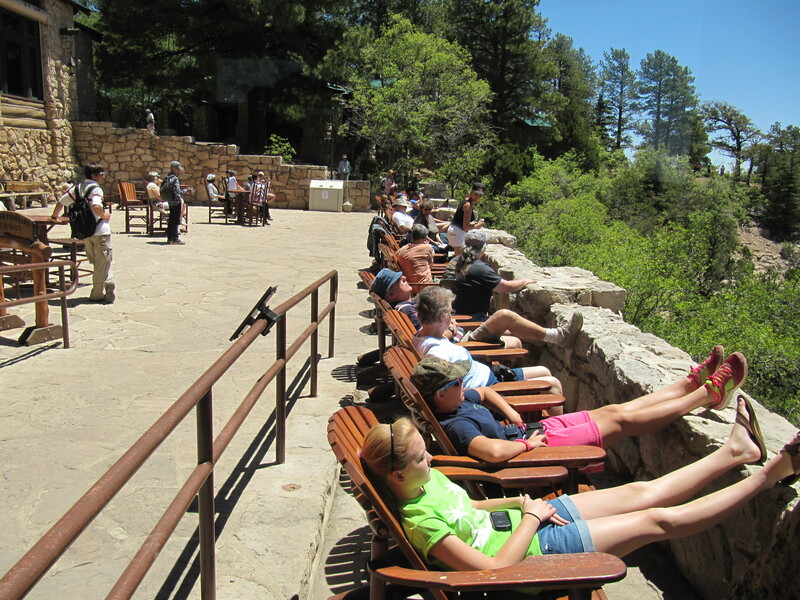 Visitor services at Grand Canyon Lodge are provided from mid-May to mid-October. 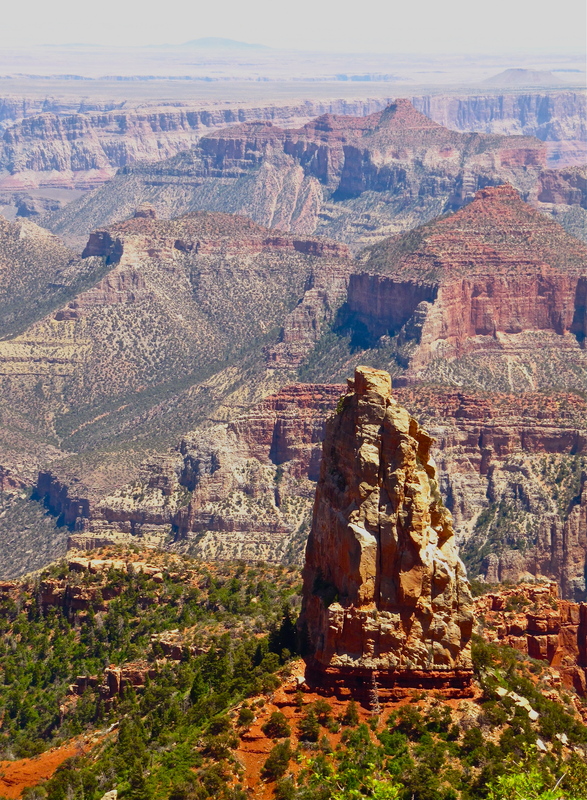 Many Canyon afficiandos profess a preference for the North Rim. 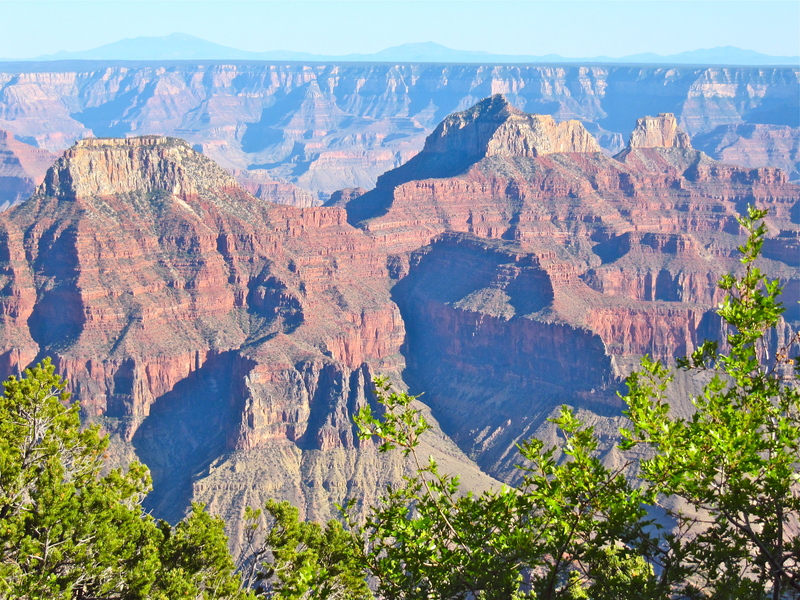 First, the number of visitors is a small percentage of those at the South Rim creating a less hectic environment. The elevation on the north is more than 1000 feet higher than on the south and temperatures are generally more moderate. Grand Canyon Lodge sits right on the rim, east and west terraces are ideal locations for photography, rest after a hike or just putting your feet up and watching the changing light. Because our trip was planned at the last minute lodging in the park was not available , we made a day trip from Kanab, Utah – 80 miles one-way. In addition to gawking and taking lots of photos we walked out to Bright Angel Point, and made the 23-mile drive and 1-mile walk out to Cape Royal with a side trip to Imperial Point. After a light deli takeout dinner enjoyed on the terrace it was time to head back to Kanab. Check! Note to self: Next time plan ahead and book two nights in one of the rim-side cabins to fully appreciate a North Rim experience. Motorist speeding down I-15 in southern Utah have no hint what’s in store if they take Exit 40. 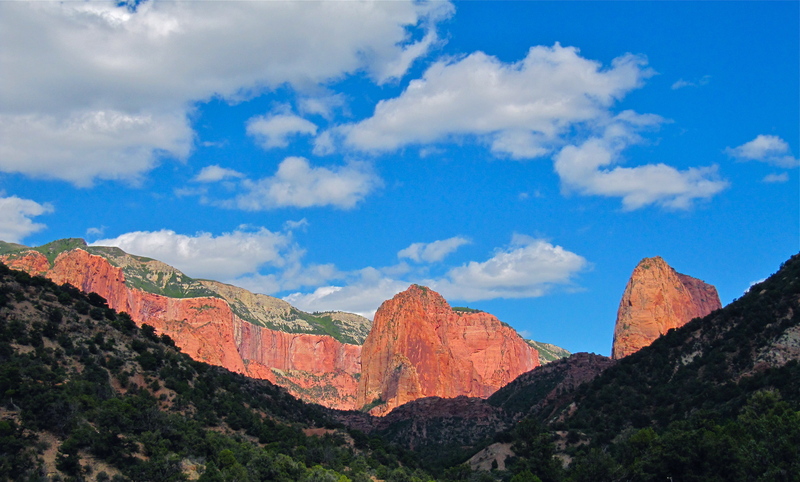 The spectacular Kolob Canyon in the northwest section of Zion National Park lies just minutes from the busy Interstate. After checking in at the Visitor Center (fee required) motorist follow a five-mile scenic drive ascending over 1000 feet in elevation to Timber Creek Overlook. Hikers find numerous trailheads for adventures into the narrow valleys of finger canyons. Rounding a curve within the first mile the view of massive red Navajo Sandstone cliffs is simply a hint of things to come. Frequent turnouts, many with interpretive signs, provide a place to ponder nature’s wonders or photograph the stunning scenery. Although the return is on the same road views appear different coming from the other direction. Horse Ranch Mountain, the park’s highest peak, is found in this section of the park. Depending on the source Kolob Arch is either the longest or second longest freestanding arch in the world. 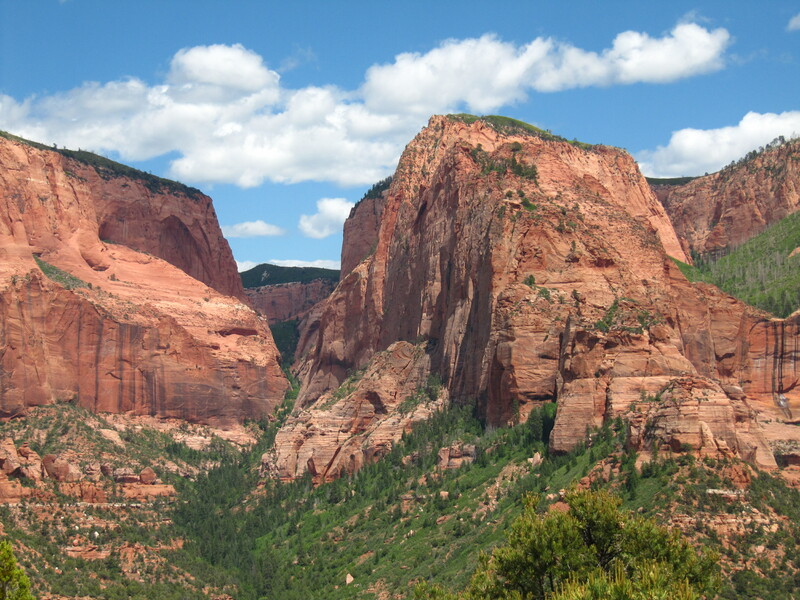 Kolob Arch can be reached from the trailhead at Lee’s Pass (about 2/3 of the way up the scenic road). 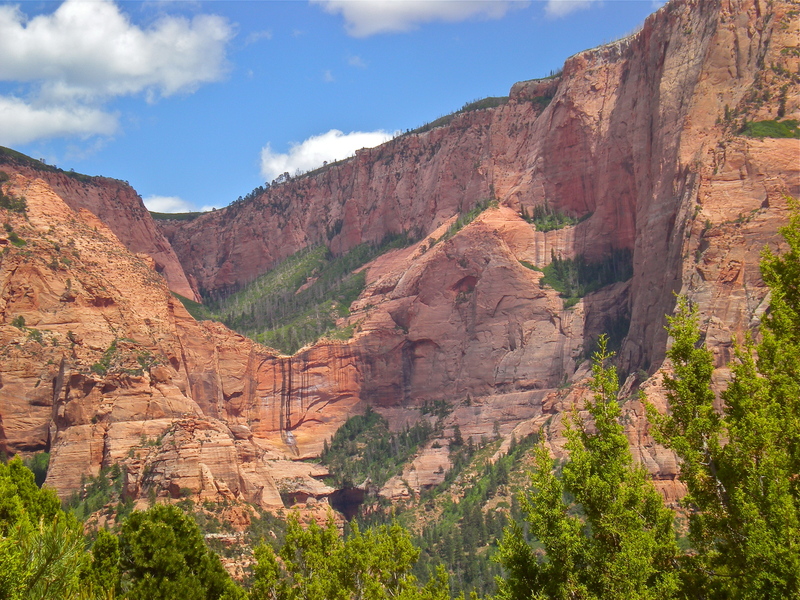 The hike is 7 miles, one-way, following LaVerkin Creek into the Kolob Wilderness. 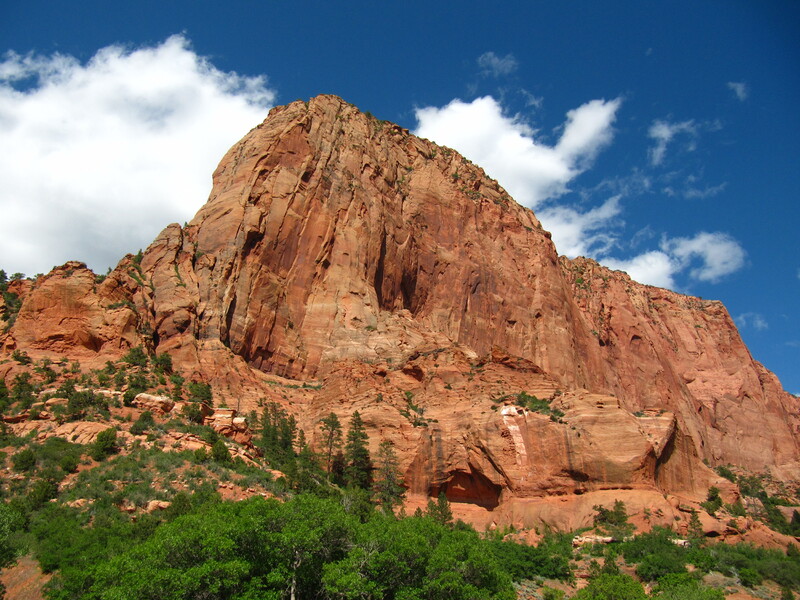 Kolob comes from Mormon scripture meaning “residence closest to heaven”. Who would have guessed it was so close to I-15’s Exit 40? While traveling from Moab to Torrey, Utah we encountered several pleasant surprises. Somewhere I’d seen a brief reference to a river museum in Green River. 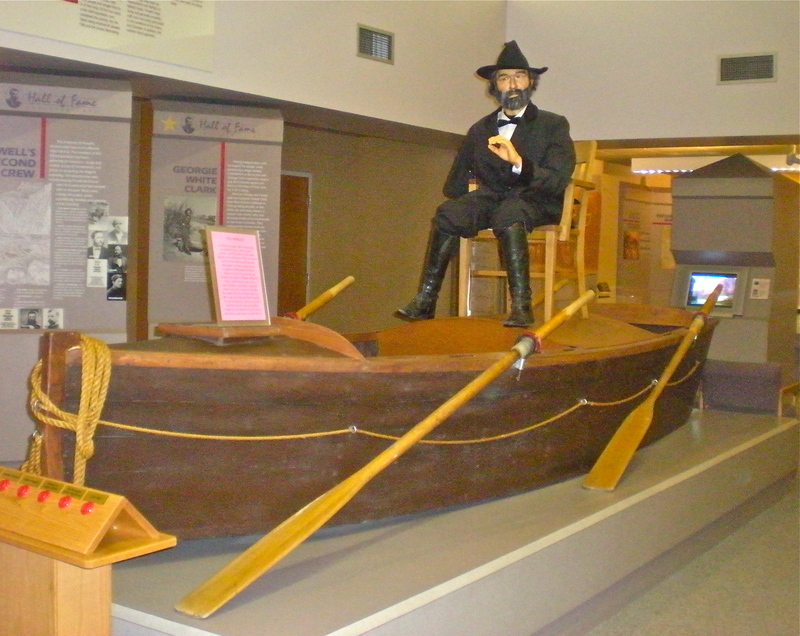 We stopped at the John Wesley Powell River History Museum expecting to have a quick look/see. We left 1 1/2 hours later. 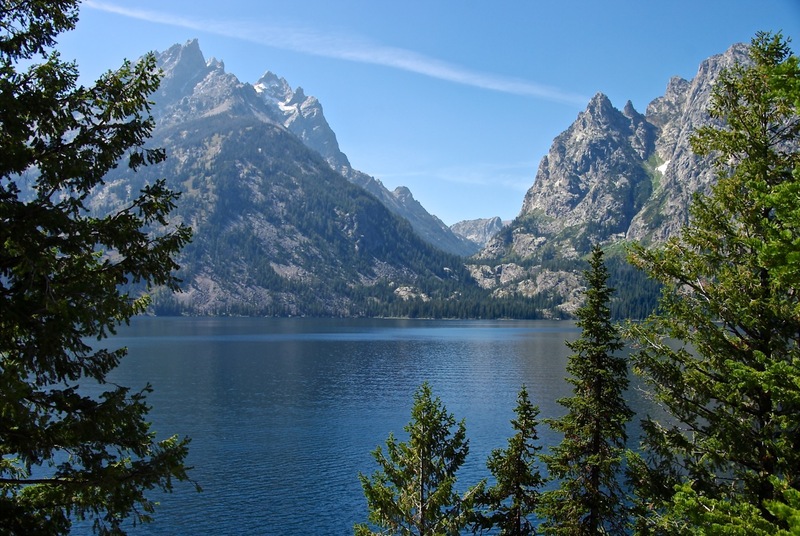 Our introduction came via a 20 minute film, Journey into the Great Unknown, which chronicles Powell’s first voyage from Green River, Wyoming through the Grand Canyon. The extremely well done film with surround sound and presented in a comfortable theater was worth the price of admission. 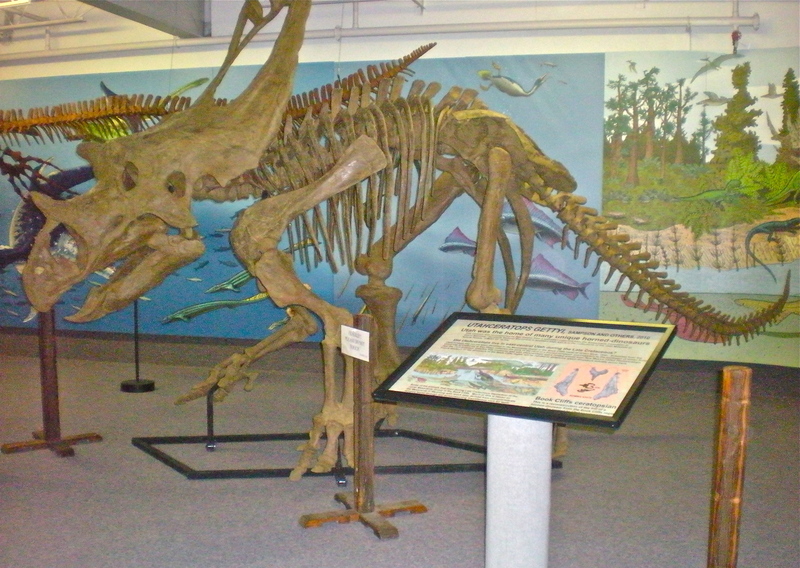 In addition to river related exhibits there’s an art gallery featuring the work of Utah artists, dinoaurs including one that was found just miles from the museum, the River Runners hall of Fame and museum store. Appropriately, the museum sits on the banks of Green River. While exploring the Fruita Historic District in Capital Reef National Park we found that in the heritage homestead Gifford House they sold fresh-baked pies and scones. An unusual feature in a National Park. At a shaded picnic table we eagerly dug into a mixed berry crumb-top pie for two. Excellent! Without knowing anything about the restaurant we chose Cafe Diablo for dinner. 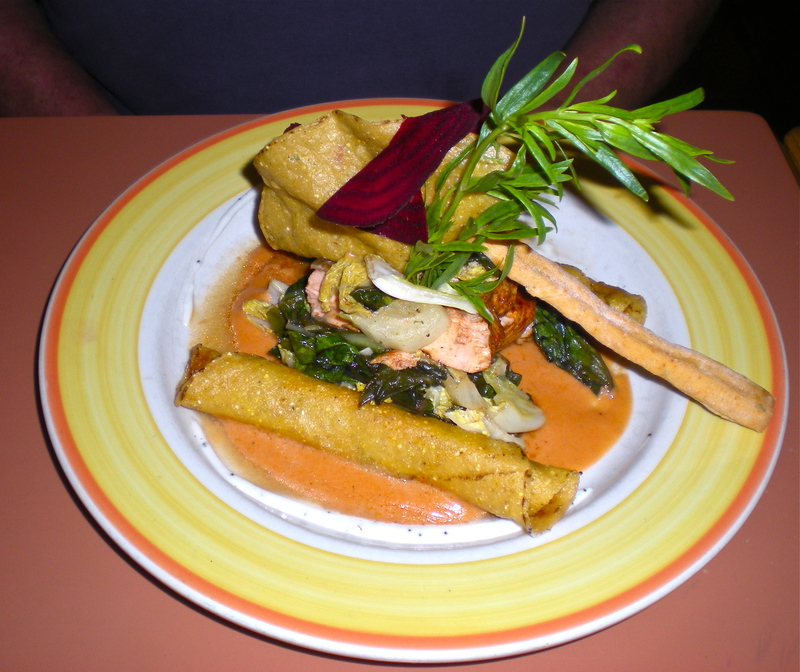 The imaginative menu was a surprise but the real surprises came with the extraordinary artistic presentations and inspired culinary creations. Attentive and friendly service added to the enjoyment. We learned that Cafe Diablo has an international reputation and following. Who would have guessed you could find something like this in a town with a population of 182 in the middle of Utah? Surprise! A day of pleasant surprises!